The $1,500 Dealer’s Choice event at the 2017 World Series of Poker attracted a field of 364 entrants, creating a total prize pool of $491,400. After three days of play, including a lightning-fast final table, the title and the $119,399 first-place prize went to none other than poker pro David Bach. 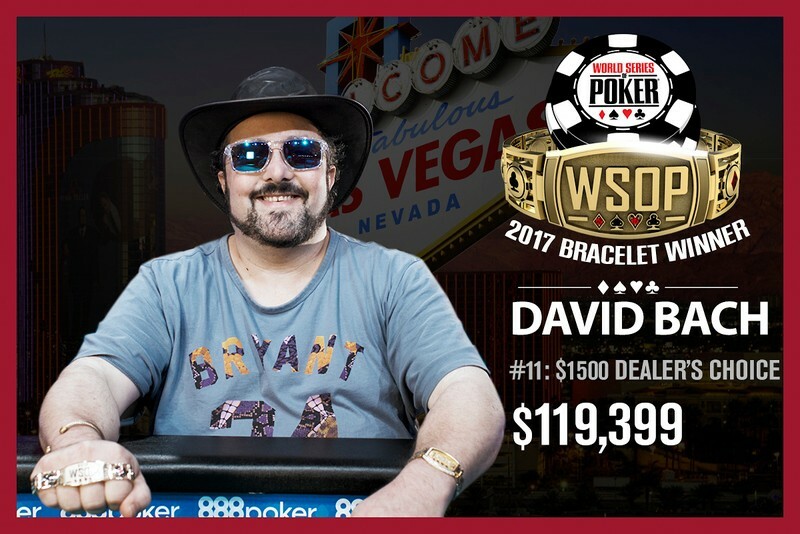 This was Bach’s second bracelet win at his 12th career WSOP final table. The 45-year-old’s previous win came in the 2009 $50,000 Poker Players Championship for $1,276,800. He had come agonizingly close to his second win many time before, with three runner-up finishes, a third-, and two fourth-place showings, all in games other than no-limit hold’em. Bach came into the final table with a massive chip lead and was never seriously threatened as he cruised to victory. The mixed-game format attracted a strong field and notables who made deep runs included the likes of Marco Johnson (30th), Tommy Hang (29th), David Benyamine (28th), Mark Gregorich (27th), Jesse Martin (20th), Alex Luneau (15th), Jon Turner (13th), Robert Mizrachi (12th), Justin Bonomo (10th), Brandon Cantu (8th), Chip Jett (7th), and Kevin Iacofano (2nd).